The acronym ERP was first used by the Gartner Group in 1990, as it encompasses the complete gamut of the evolution of application integration beyond manufacturing. In the 1990s the system grew like wildfire and companies took the opportunity to replace their old systems with the new suite of integrated applications. The shift was due to the Y2K issue and introduction of the Euro currency. The technology gradually matured over the years both in hardware and software owing to large scale adoption in business houses where most players in the manufacturing industry have migrated towards ERP products; thus, making the application practice morph and evolve to fit various business processes. Havells India began its implementation of the matured system software in 1999 where it received added benefits of online availability of information and higher service standard through the removal of human points. Having the infrastructure ready for adoption of continuous new technologies relieves the customer of the chaos of backend office operations. The working level has evolved to a smarter level today where integrated books of accounts are treated as basic needs of an organization; the integration of sales, inventory, finance and sourcing of any organization for that matter is a must rather than a luxury. The need is easily procured as the cost of the integrated real-time software has considerably reduced for adoption towards business operations. 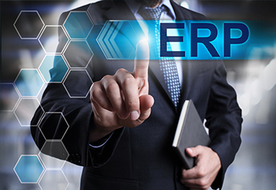 Evidence is seen where even trading organizations of some reasonable sizes are adopting ERP rather than a simple software for their various operational processes. In Havells, the software has perfectly integrated the requirement of front end customer to the back end supplier and aligned the working of grass root level employees with the top management as the system is standardized and automated. ERP with advantages of improved visibility and compliance also has established a robust reporting system giving a single view of information across the organization. It helped us in bringing efficiency in our work by improving their skill sets especially where the industry is lacking the domain knowledge. For instance, supply chain management, a weaker domain in manufacturing, benefitted a lot with the best practices offered by ERP. And in similar respect, for IT Department, the business management software acted as an enabler to the organization. It helped in creating a platform for effective market strategy and tight integration with all associates viz. customer, supplier and employees. Adversities that hinder the endorsement of the systems are prevalent mostly among marketing and production departments of various enterprises. Organizational departments tend to overlook the importance of its implementation and hence, result in a skewed perception of mapping system that does not sync with the organizational practices. Other consequences as a result include overburdened customizations creating blockage for implementations of other normal features. On the other hand, lack of domain knowledge and vision with respective to core team members are creating a setback leading to mapping of manual processes with lot of work duplication. At times, illogical user specific requirements delay the implementation or force the implementers to skip the activation of a certain normal feature. The most difficult part is initiation of the process that is not in practice with an organization. It requires focus involvement from top management with complete support. The tail end of worries continues as the business management software faces hindrances like non-alignment of physical working with process defined system, casual approach to project time lines by certain internal departments and lastly, over selling by implementation vendors by taking work order of modules with no skill set. Being a CIO, we face two major challenges while dealing with ERP; internal and external. Internal challenges aggravate when an organization grows and new technology is required to be adopted including budgets, adoption of technology and process owner’s intuition as of when to buy new technology. The key external challenge is ever changing new technology that surprises IT heads and causes one to ponder at the existing investments. Since new technologies emerge at fast pace and in short period of time, it is challenging even to have reasonable return on investment. Despite large numbers of vendors in the market, one can categorize promoters according to the level of organization and its future road map. Categorization can help one in selecting the top three or four vendors and then evaluate them against business requirement. This entails the involvement of all process owners to present a consolidated list of requirements. Further assessment of the vendor is required by linking their product functionalities with organization's requirements. One can create a tool on excel by ranking the feature availability with the requirement to make the assessment more objective. It is also mandate to make good review of the future road map of product, after sale support, response time to statutory changes and easily availability of skill set. By and large ERP products take care of all business requirements and in addition to that their response time to local statutory changes is good. However, they can look for providing a single window support to users for software support as well as functional consulting. The software vendor can also work on providing the guideline for general customization of their products. They also need to offer feature upgradation as a part of support contract rather than a new product with additional price.